We are the creative professionals who produce non-fiction television in New York. We have many different titles and work for many different companies. Many of us are freelancers, earning our living at multiple companies in a year. Some of us are on staff. Some of us are new to the industry, and some of us are at the tail-ends of long careers in television. All of us work hard to produce a show we can be proud to attach our names to. All of us are concerned about how increasingly difficult it has become to build a career in this industry. None of us believes we should wait for someone else to decide to address the problems we face in this industry. We are organizing across New York City to tackle these issues OURSELVES. Who can be part of this movement? Note: the actual work you perform determines your eligibility to be covered by the contract—not necessarily the job title you’ve been given. 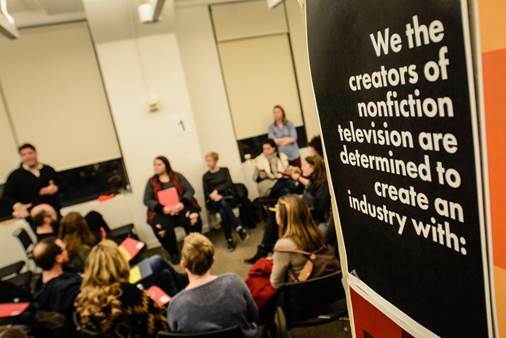 If you have any questions and would like to speak to an organizer confidentially, please email: organizing@wgaeast.org.